Dawkins - married to the most intelligent and beautiful woman to have ever played a Time Lord - is a pro-evolution fundie. It is a matter of personal opinion whether this is a good or bad thing, but when researching the 'flaws in evolution' section of my book 'Secrets & Lies' I found claims about his fundie tactics that if true are truly as frothing and fundie as any US evangelist. Fundie anything is bad, I think. 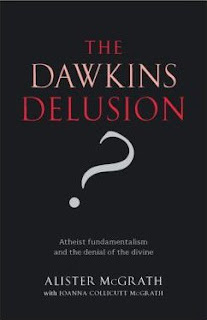 I'm not bothered by Dawkins' opinions; I'm bothered that he might succum to the common temptation of thinking: "I'm so sure I'm right and those who disagree are wrong, that maybe they shouldn't be ALLOWED to disagree with me." What follows is a dictatorship. Many atheists have this self-delusion that bigotry and fundamentalism are exclusively afflictions of the irrationalist and that rationalists are above all that. That's a fallacy and it's a bubble that needs bursting. Have you seen "The Trouble With Atheism"?